First-time author Domingo Martinez is a finalist for the 2012 National Book Award for nonfiction, for The Boy Kings of Texas. He's the only non-Pulitzer Prize-winning finalist in that category, and Lyons Press is the only "small" publishing house in that category. In a starred review, our reviewer said the memoir is "concerned with the deep distress of a border town [Brownsville, Tex.] kid unclear on his place in the world. Martinez's story is heartrending and uncomfortable, but he maintains a surprising sense of humor that keeps his reader cringing and rooting for him." Martinez was surprised: "My phone started glowing around 6 a.m., and I happened to be awake. My first thought was, 'Wow; those bill collectors are starting much earlier nowadays,' and I ignored it because I didn't recognize the number, until it went off again about five minutes later and it was my agent, Alice.... I depend on her to translate most of what happens in this business because I'm so new at it, and I was registering some serious excitement, but I didn't know how to interpret it. I mean... it just wasn't computing that I was A FINALIST for THE NATIONAL BOOK AWARD. What's really funny is, when you read through that list, it's almost like the writers are putting question marks behind my name and book title, like 'Who the hell is this guy??' "
In a recent NPR interview, Martinez said, "If I stop to think about it, I might seize up. So instead, I'm reorganizing my Netflix queue.... The term 'dark horse' has been mentioned once or twice, and I have to chuckle. I wasn't even in the race two years ago. I wasn't even a horse, for that matter." It’s 1971, one year after the killing of famed LA Times reporter, Rubén Salazar. A junior reporter, Alejandra Marisol, who works for the LA Times is asked to write a commemorative piece on Salazar in recognition of the one-year anniversary of his death. While doing work for the piece, Alejandra finds that she is embroiled in a murder mystery that appears to have ties to Rubén Salazar’s death. Alejandra uncovers a world of evil and corruption with the help of an unlikely collection of people who become heroes and who challenge us to think differently about ourselves and the world we live in; Rocky the philosophizing WWI veteran, Sumire the clairvoyant ex-Japanese internment camp prisoner, Tia (Aunt) Carmen, the wise-cracker who can wield a powerful left leg jab with a retractable prosthesis, Tony and Chucho, the neighborhood homeboys, and Gato the wonder cat. Alejandra also gets help from a dancing Jesus who feels misunderstood, and from his mom, Mary, who bestows Alejandra with a tube of lipstick that helps Alejandra unleash her inner strength. The reader will travel through streets and townships where rich Angelino culture comes to life, and where tragedy and despair are transformed into hope. Maria grew up in the Highland Park neighborhood of Los Angeles and moved from the area in 1984 to attend a Ph.D graduate program in Immunology at UC Berkeley. Maria currently resides in Oakland and works as a Professor of Biology at California State University, East Bay where she has been engaged in underrepresented minority student recruitment, teaching, and research for over 22 years. As a researcher and educator Maria’s writings have taken the form of scientific journal publications, and more recently popular press articles. Pig Behind The Bear represents Maria’s first work of fiction. María Nieto’s Pig Behind The Bear is definitely a double treat: a fast-paced mystery story and a coming of age novel. At the center of both stories is Alejandra Marisol, a young L.A. Times journalist, who is as smart and courageous as she is charming and sensitive. While researching a story about the late L.A. Times reporter Rubén Salazar in 1971, she stumbles across a number of ritualistic murders and other crimes against the most vulnerable among us: the children and the immigrants. Her outrage fuels her determination to bring to justice the criminals. María Nieto has penned a most intriguing crime story, featuring a young heroine but also plenty of engaging characters of all ages—and yes, with plenty of romances for all ages, too! Pig Behind The Bear is sure to capture the attention of both younger and older readers, who will keep turning the pages as fast as they can till the thrilling and satisfying end! Brava, María! Encore: otra, otra! Review by Lucha Corpi, author of Eulogy for a Brown Angel: a Gloria Damasco Mystery. I've been working with the staff of Arte Público Press on my next novel (and first book-length crime fiction in a few years). I've even been privileged to review suggested cover art - I think the cover will be a knockout. La Bloga readers will see it first when it's ready. 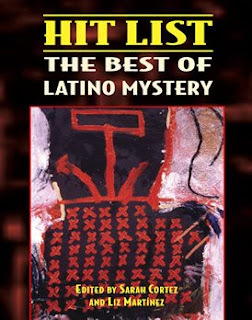 The book is entitled Desperado: A Mile High Noir, and it features Gus Corral, a character from my short story The Skull of Pancho Villa that appeared in the anthology Hit List: The Best of Latino Mystery (Arte Público Press, 2009.) Gus tangles with cartel thugs, con men and women, stolen religious icons, over-exuberant federal agents and Denver cops, and dangerous pals from his youth, all played out against the tensions surrounding the economic and social changes to his neighborhood in Denver's North Side, also known as Highlands. It's great to be back on the gritty Denver streets. The book is set for a Spring, 2013 publication date. In Houston on my book tour, Nicolás invited me to Arte Público and we had a great discussion. Among other things, he asked my opinion of the three covers for your book. Never fear. I advised him you'd probably prefer something without a virgen.